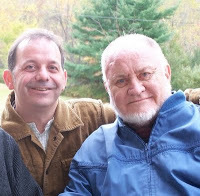 Boston, September 23, 2015 – DignityUSA mourns the passing of John J. McNeill, a seminal figure in the history of the 46-year-old organization of LGBT Catholics and allies, as well as the broader LGBT civil rights movement. McNeill died on the evening of September 22 at the age of 90 in hospice care in Fort Lauderdale, Florida, in the presence of his devoted spouse and partner of 49 years, Charles Chiarelli. A former Jesuit priest with a doctorate in philosophy from Louvain University in Belgium, McNeill helped inspire the founding of Dignity with articles in theological journals in the 1960s that for the first time challenged Catholic Church teaching on homosexuality from an authoritative theological and scholarly perspective. In 1972, he convened the meeting that led to the founding of Dignity’s New York City chapter. His groundbreaking, bestselling 1976 book, The Church and the Homosexual, was an international sensation that landed McNeill on the Today show and sparked widespread debate. Subsequent books, including Taking a Chance on God and Freedom, Glorious Freedom, extended McNeill’s discussion more deeply into the pastoral and personal realms of LGBT Catholic and Christian experience. In 1987, McNeill was expelled from the Jesuits after nearly four decades for refusing to be silenced by the Vatican on LGBT issues. The same year, he was Grand Marshal of New York City’s LGBT Pride March. Until recent years, he pursued a multi-faceted vocation as a psychotherapist, spiritual director, retreat leader, and author, with a constant focus on the needs of the LGBT community. In addition, along with Fr. Mychal Judge, he founded The Upper Room AIDS Ministry, an outreach for homeless persons with AIDS in Harlem. Through these activities, he offered hope and healing—at times literally life-saving—to countless people around the globe. Born and raised in Buffalo, McNeill entered the U.S. Army in 1942 and became a prisoner of war in Nazi Germany—an experience that for him was profoundly spiritual and led him to enter the Jesuits in 1948. Ordained in 1959, he taught philosophy and theology at Fordham University, Union Theological Seminary, and Le Moyne College, where he was a noted peace advocate during the Vietnam War. A powerful presence at nearly every Dignity convention and in many Dignity communities until recent years, McNeill was presented with DignityUSA’s Lifetime Achievement Award in 1997. In 2011, he traveled to Rome, where, along with European LGBT leaders, he delivered a letter to then-Pope Benedict XVI at the Vatican. The letter asked for dialogue and urged Church leadership to speak out against the violence, injustice, and discrimination experienced by LGBT people around the world. In 2012, McNeill was the subject of Taking a Chance on God, a documentary film produced and directed by Dignity member Brendan Fay that highlights his role as priest, gay man, activist, author, spouse, and pioneer of the international LGBT civil rights movement.